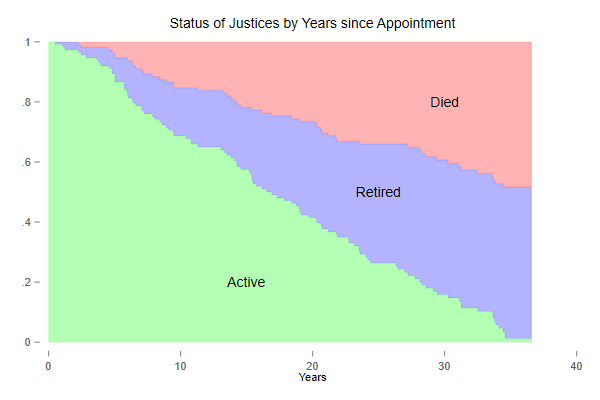 Singer and Willet (2003) Applied Longitudinal Data Analysis, Oxford, analyze data on the length of service of U.S. Supreme Court Justices, treating death and retirement as competing risks, and age at appointment and calendar year of appointment as predictors. To conduct a similar analysis I extracted data from Wikipedia and the Supreme Court website, and prepared a comma-separated-value file with the justice number, name, and strings representing the dates of birth, the dates tenure starts and stops, and a status variable that takes the values Incumbent, Died, Resigned or Retired. I ignore the return engagements of John Rutledge and Charles Evans Hughes, who resigned and later were reappointed as Chief Justice. We start by reading the data and converting the dates from strings to the native date format in your statistical package. Note that stopstr is empty for incumbents. We set it to February 22, 2018 for these cases, effectively censoring the data as of the date this analysis was run. 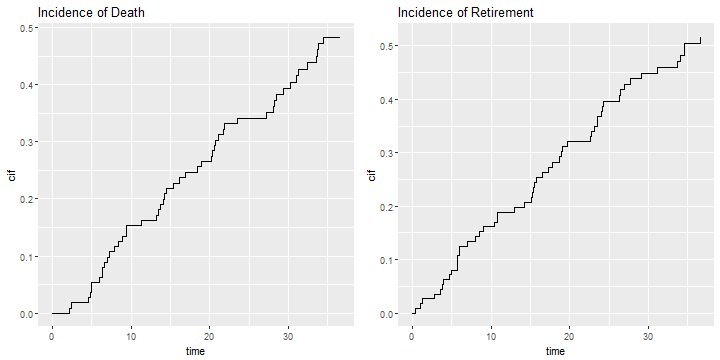 I calculate tenure in years dividing by 365.25. The event indicator is coded 0 for current Justices, 1 for those who died while serving, and 2 for those who resigned or retired. I also compute age at appointment and year of appointment, and save the dataset for later use.
. replace stopstr = "February 22, 2018" if stopstr == ""
failure event:  event != 0 & event < . The median length of tenure in the court is 16.5 years. The command stcompet, written by V. Coviello and M. Boggess (2004) “Cumulative incidence estimation in the presence of competing risks” Stata Journal, 4(2):103-112, can estimate incidence functions. We specify death as the event of interest and retirement as the competing event. We will use the function cuminc() in Bob Grays’s cmprsk package to estimate cumulative incidence functions. 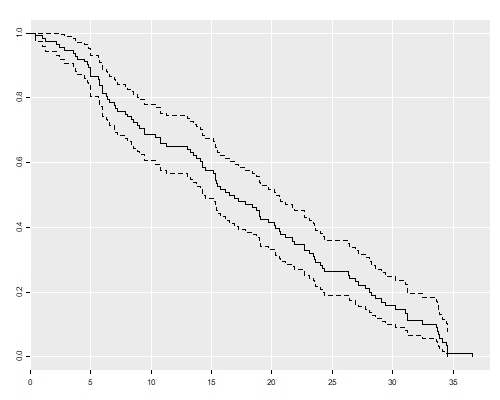 We now build a nice plot that combines the Kaplan-Meier estimate of overall attrition with the cumulative incidence functions showing atrition by cause. This takes a bit of work, but I think the result is worth the effort. We use the fact that the survival and incidence functions add up to one, S(t) + I1(t) + I2(t) = 1, so the areas in the plot have boundaries 1, 1 - I1(t), S(t) and 0. 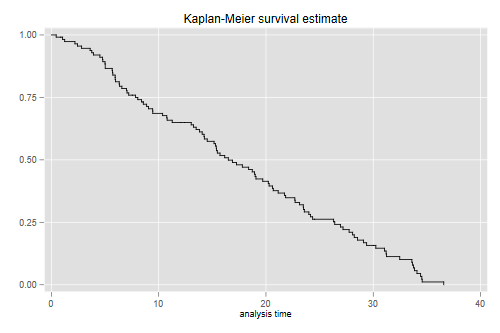 The survival can be obtained from Kaplan-Meier or as the complement of the sum of the incidence functions. 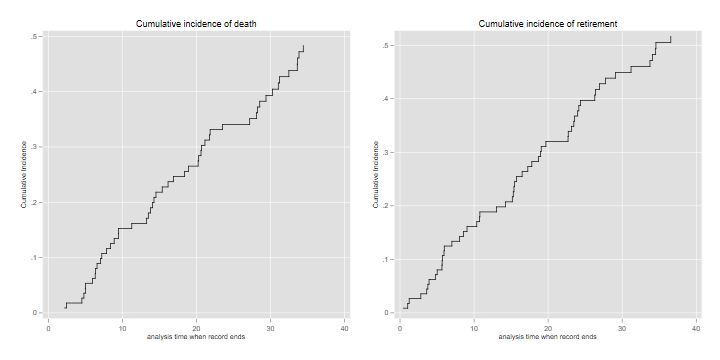 In Stata we start by extracting the CIF for death, and fill in the times for other types of events, which are coded as missing. We also add a dummy observation so the plot actually starts at time 0. In R we have to deal with the fact that survfit() and cuminc() arrange their results differently, and that the times do not line up. My solution merges the estimates and uses a simple function to fill the gaps. For the plot itself I found it easier to draw the areas using polygon(). 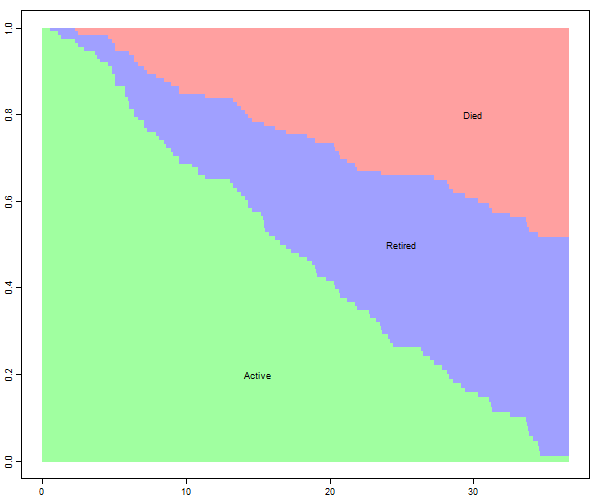 The green area is the survival function, showing the probability of remaining in the court, and the other two areas partition attrition into death and retirement, based on the incidence functions. In the long run death and retirement are approximately equally likely.